What Was The Hilton Thinking?! Check out these suave Phi Sigs, attending the “First, and last formal at the Atherton Hilton. “These are the Road Dogs. Tim Finn ‘92, Mike Pries ‘94, Marc Hourvitz ‘91, and Sean Babik ‘91 across the top. Rob Carter ‘91, Bill Garomen, Troy Thornton ‘91, Rick Derrickson ‘91 and Dave Gray ‘91 across the Bottom. The first and last Fraternity event hosted by the Atherton Hilton. What was Hilton thinking? 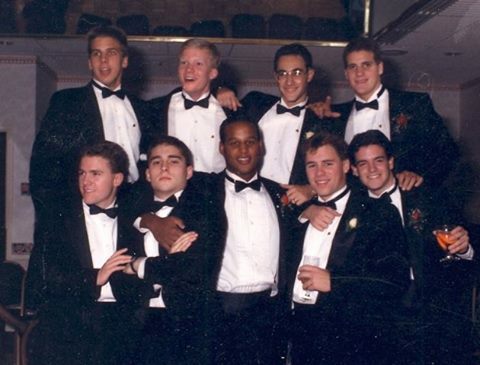 The photo was correctly identified by Rick Derrickson ’91, via our Facebook page, found by clicking HERE. Michael Vereb ‘91 also weighed in. 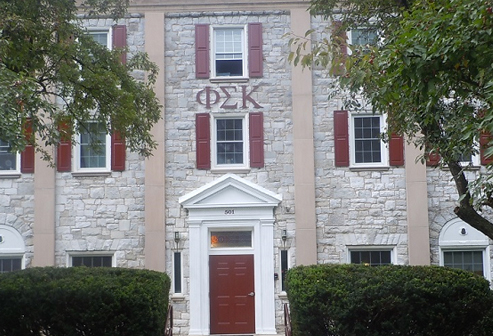 “This was the beginning of a great run at Phi Sig. I still vacation each fall with four of these guys and it is my favorite weekend of the year. Pete Adams ‘96 writes “That's a famous photo. Can't recall where I saw it, but the Road Dogs were house royalty as seniors in the fall of 1990 when I pledged as a freshman and eventually became a Lugie. Bob Hughes ‘94, is that how we spelled it? To see more great photos (and banter between the Brothers), check us out on Facebook!